Michael Peña (left) and Stephen Colbert. 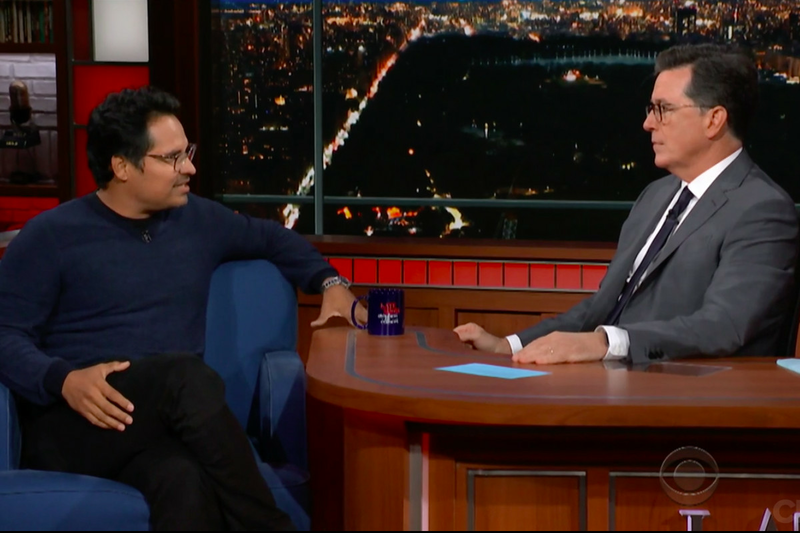 — Actor and Chicago native Michael Peña talked Chicago food on Thursday night on Late Night With Stephen Colbert. Colbert and Peña chatted about their experiences in the city, but it appears Peña has a shrinking memory. Peña, who appeared in Ant-Man and the Wasp,repeatedly referenced “Gold Coast Italian Beef,” a restaurant that doesn’t exist. Perhaps he meant Gold Coast Dogs which serves Italian beef. Regardless, Peña said he ate an Italian beef on Wednesday: “I had it hot, which, by the way, you should not do that when you’re taking a long flight.” Colbert dropped a D’Amato’s Bakery reference, mentioning the West Town Italian bakery’s famous bread. Colbert also talked Mr. Beef (presumably Mr. Beef on Orleans, not the Homer Glen location): “I like Mr. Beef because I’d go sweet peppers and wet. Because you go hot or sweet peppers and wet ‘cause it gets the whole thing — you can really shove it down your mouth. You literally dip the whole bun in the jus. Eat it faster than the Japanese guy [Takeru Kobayashi] at the Nathan’s [hot dog] contest.” Check out the whole clip here. — Longtime Lakeview bar Brendan’s Pub will shutter after service on Sunday night at 3169 N. Broadway Street, Block Club reports. — The Loop classic The Berghoff has a name for its new brewery: Adams Street Brewery. It’s slated to start brewing beer within the restaurant at 17 W. Adams Street in the fall, a rep says. — Ofrenda, a Berwyn-based Mexican food truck, won the opportunity to open a brick-and-mortar restaurant in suburban Yorktown Center. The shopping center hosted more than a dozen chefs in its “Taste for the Space” competition which offered six months free rent and $50,000 to open in a vacant space there. — Juniper Spirits and Oyster, the restaurant that opened in May in the new Claridge House hotel at 1244 N. Dearborn Parkway, has given Gold Coasters a new brunch option. The restaurant’s Sunday daytime service features lobster and steak Benedicts, a BLT with triple-crème cheese and tomato jam, bloody Marys and Micheladas. — And finally, Wrigleyville gets a food truck festival on Saturday at Gallagher Way adjacent to Wrigley Field. Da Lobsta, Auntie Vee’s, and eight more trucks will serve food tomorrow between 2 and 7 p.m. while the Cubs-Cardinals away game plays on the video board. Admission is free but a $5 donation is suggested.